The Galileon model is a tensor-scalar theory of gravity which offers a theoretically viable explanation to the late acceleration of the Universe expansion and recovers General Relativity in the strong field limit. The main goal is to establish the status of the model from cosmological observations. Though, the multi-messenger observation of GW170817 and its consequences for the Galileon model will be briefly discussed, since most allowed Galileon scenarios have a gravitational wave speed different than the speed of light. Most constraints obtained so far on Galileon model parameters from cosmological data were derived for the limited subset of tracker solutions and reported tensions between the model and data. We present here an exploration of the general solution of the Galileon model, which is confronted against recent cosmological data. We find that, while the general solution provides a good fit to CMB spectra, it fails to reproduce cosmological data when extending the comparison to BAO and SNIa data. Tensions remain if the models are extended with an additional free parameter, such as the sum of active neutrino masses or the normalization of the CMB lensing spectrum. Optimal transport has become a mathematical gem at the interface of probability, analysis and optimization. It is a theory longly developed by the mathematician community, started by Monge and followed by Kantorovich which found applications in several fields like differential geometry, PDEs or gradient flows just to name a few. 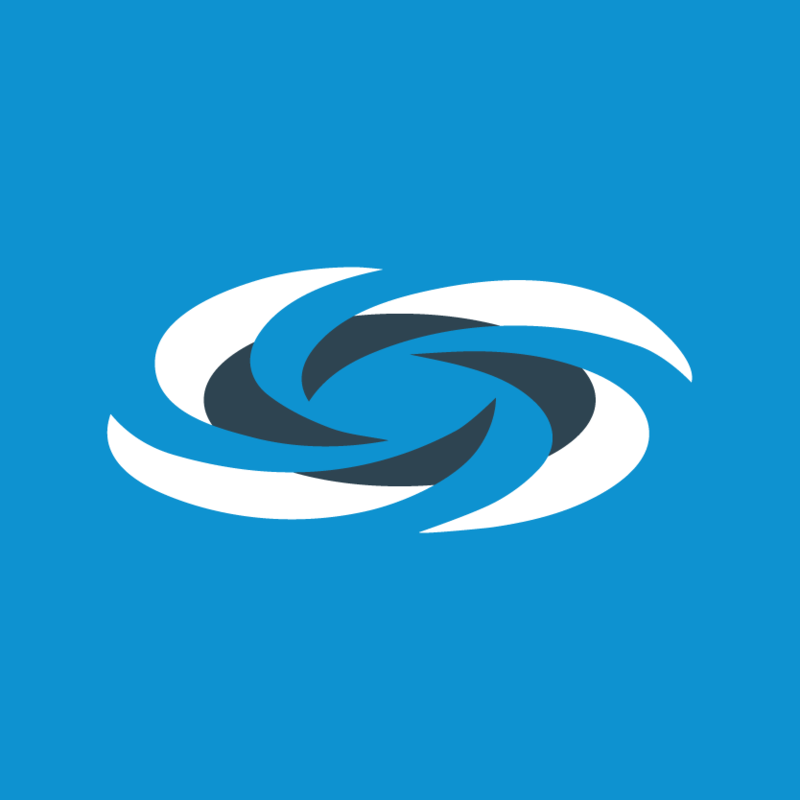 Lately, it began to make its way into the machine learning and data treatment community. The optimal transport can be used to define a distance that is very useful when comparing histograms or point clouds, a typical scenario in nowadays applications. Some breakthrough contributions, like the entropic regularization, allowed to convexify and efficiently solve the transport problem opening the doors for many applications like Wasserstein barycenters or dictionary learning for example. Nevertheless, Optimal Transport has not entered fully into the signal treatment community. One of the obstacles is the fact that the theory is well developed in the space of nonnegative measures but very little work has been done to extend it to signed measures. Considering a machine learning point of view, this presentation will deal with some theoretic aspects of an Optimal Transport based "distance" for signed measures that can be useful for future applications like Blind Source Separation. An algorithm for its efficient calculation will be presented as well. Image-based immunoassays are used every day across the world to develop new drugs, diagnose diseases, and research the workings of the human body. Since August, some of these are analyzed by technology that, at its core, has an algorithm included in my Ph.D. work. In this talk, I will outline the research project that lead to this algorithm and go through the modeling and optimization results we present in  and . This will include, among others, the modeling of complex biochemical assays as systems of partial differential equations, a linear-systems view on diffusion models, investigations in group-sparsity regularization in function spaces, and first-order methods for optimization problems with more than 25 million variables. To conclude the presentation, I will go through the new paths we have started to explore in connecting all this work to deep learning frameworks . CEA Saclay is around 23 km South of Paris. 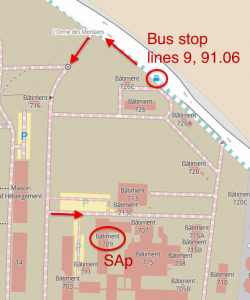 The astrophysics division (DAp) is located at the CEA site at Orme des Merisiers, which is around 1 km South of the main CEA campus. See http://www.cosmostat.org/contact for detailed information on how to arrive. 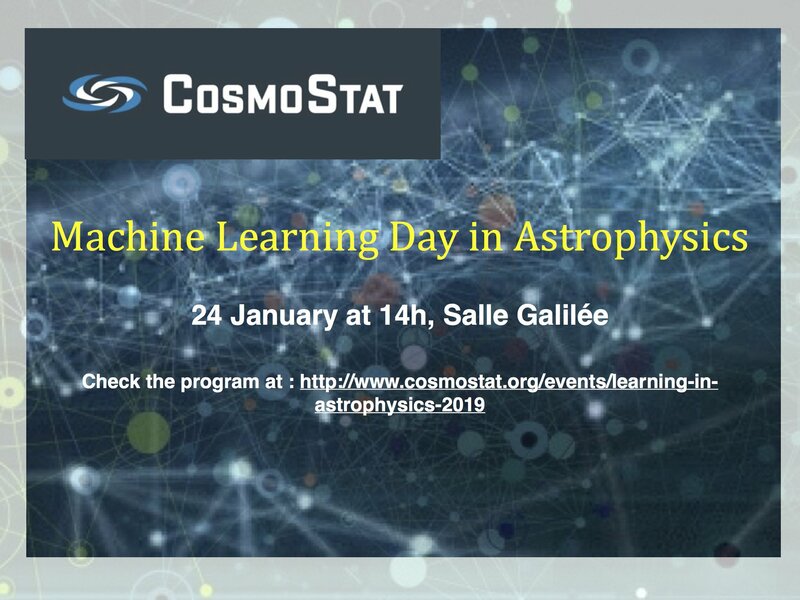 On January the 24th, 2019, we organize the fourth day on machine learning in astrophysics at DAp, CEA Saclay. Machine Learning has been used somewhat in HEP in the nighties, then at the Tevatron and recently at the LHC (mostly Boosted Decision Tree). However with the birth of internet giants at the turn of the century, there has been an explosion of Machine Learning tools in the industry.. A collective effort has been started for the last few years to bring state-of-the-art Machine Learning tools to High Energy Physics. This talk will give a tour d’horizon of Machine Learning in HEP : review of tools ; example of applications, some used currently, some in a (possibly distant) future (e.g. deep learning, image vision, GAN) ; recent and future HEP ML Kaggle competitions. I’ll conclude on the key points to set up frameworks for High Energy Physics and Machine Learning collaborations. Convolutional dictionary learning has become a popular tool in image processing for denoising or inpainting. This technique extends dictionary learning to learn adapted basis that are shift invariant. This talk will discuss how this technique can also be used in the context of large multivariate signals to learn and localize recurring patterns. I will discuss both computational aspects, with efficient iterative and distributed convolutional sparse coding algorithms, as well as a novel rank 1 constraint for the learned atoms. This constraint, inspired from the underlying physical model for neurological signals, is then used to highlight relevant structure in MEG signals. Modified gravity models that include massive neutrinos can mimic the standard concordance model in terms of weak-lensing observables. The inability to distinguish between these cases could limit our understanding of the origin of cosmic acceleration and of the fundamental nature of gravity. I will present a neural network we have designed to classify such cosmological scenarios based on the weak-lensing maps they generate. I will discuss the network's performance on both clean and noisy data, as well as how results compare to conventional statistical approaches. In this talk, I will address the challenging problem of optimizing nonsmooth and nonconvex objective functions. Such problems are increasingly encountered in applications, especially when tackling joint estimation problems. I will propose a novel algorithm and demonstrate its convergence properties. Eventually, three actual applications in industrial imagery problems will be presented. to parameter estimates. Machine learning techniques can provide an automated and robust way of dealing with these blended sources. In this talk I will discuss how machine learning can be used to classify sources identified in survey data as blended or not and show some preliminary results for CFIS simulations. I will then present some plans for future developments making use of multi-class classification and segmentation. The discovery of the Cosmic Microwave Background (CMB) by Penzias and Wilson in 1964 was an important confirmation of the Big Bang theory. The CMB constitutes a background of photons emitted during the first instants of our Universe history, and still permeates it today. Since its discovery, numerous telescopes, balloon-born, or satellite experiments such as Planck, have made it possible to produce measurements and precise temperature maps of the CMB, of which we have been able to deduce important information about our Universe. However, a piece of the cosmological puzzle is still missing: the inflation, corresponding to a short period during which the Universe would have seen its size growing exponentially. Inflation is a theory introduced to solve several major cosmological questions, and which, to date, has only been verified indirectly. The inflation phase, however, should produce a stochastic background of primordial gravitational waves that may have left an imprint on the CMB. More particularly, these gravitational waves would induce the so-called B-modes patterns on the polarisation maps of CMB photons. The precise measurement of the B-modes, still undetected to this day, represents the most powerful probe of inflationary physics. The B-modes expected signal is however of low intensity, and many additional experimental difficulties arise when aiming at measuring it. Dust from our own galaxy partially masks the CMB, and many models are developed to clean up galactic contaminations. The extraction and analysis of the measured data signal thus requires the development of precise statistical algorithms. These must take into account the complexity of the data produced, such as residual galactic contaminations, incomplete sky map coverage, as well as statistical and instrumental errors. The non-zero mass of neutrinos suppresses the growth of cosmic structure on small scales. Since the level of suppression depends on the sum of the masses of the three active neutrino species, the evolution of large-scale structure is a promising tool to constrain the total mass of neutrinos and possibly shed light on the mass hierarchy. I will discuss recent progress and future prospects to constrain the neutrino mass sum with cosmology, with a focus on observables in the nonlinear regime. Weak lensing has been shown as an outstanding tool to constrain cosmology. The state-of-the-art studies have used the power spectrum and peak counts as estimators, and the combination of the two can break down parameter degeneracies and maximize the information extraction. To constrain cosmology with both estimators, understanding the joint covariance is crucial. However, calculating it analytically seems to be intractable for peaks, and the empirical approach with N-body simulations will be expensive as the size of lensing surveys increase. I will present a fast solution to solve this problem. The proposed approach simulates lognormal fields and halo models to predict lensing signals. We compared the resulting joint covariance with the one from a large number of N-body simulations and found an excellent agreement. In addition, our approach is orders of magnitude faster than N-body runs.